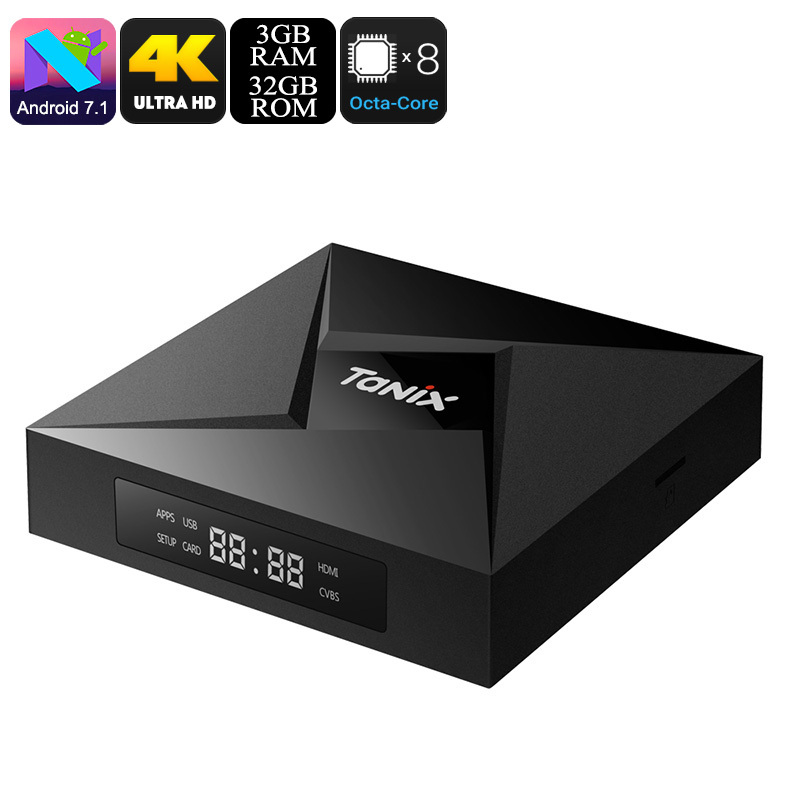 Successfully Added TX9 Pro Android TV Box - Android 7.1, Octa-Core CPU, 3GB RAM, Bluetooth, WiFi, Google Play, 4K Support, DLNA, Miracast, Airplay to your Shopping Cart. With the TX9 Pro Android TV Box at your side, you’ll no longer be limited to watching boring TV shows and movies. This Android Media Player lets you enjoy your favorite movies, games, and Apps straight from your big screen TV. It even supports WiFi thanks to which you’ll be able to use your television set to browse the internet. With Google Play installed, this Android TV box literally treats you to unlimited fun and entertainment. The media player runs on Android 7.1, meaning that a smooth and lag-free user experience is guaranteed. Whether you simply wish to watch a movie with your family or play some games with your friends – nothing is too much for the TX9 Pro TV Box. Within its sleek body, this Android TV box hides some significant hardware. This Android media player packs a powerful Octa-Core processor that has been clocked at 1.5GHz. Additionally, it treats you to a whopping 3GB RAM that supports all your multitasking needs. Thanks to its powerful hardware, this TV box is capable of handling anything you throw at it. It even supports 4K media files at 30fps. This means that you’ll be able to enjoy the latest 4K films and series in absolutely stunning Ultra-HD resolutions. To further increase your overall user experience, this Android TV box supports Miracast and Airplay. These fun little features allow you to easily mirror all that’s happening on your phone or tablet’s display onto your TV. For easy file sharing, the TX9 Pro Android Media Player comes with DLNA and Bluetooth. The latter even allows you to use your gizmo with external gadgets such as a wireless mouse, keyboard, or game controller.